tgif and tgff (thank god for floors) – Hi, I'm Caroline. Wow, this week has flown by… there’s been so much excitement, and I think I lost Tuesday and Wednesday in the chaos. But thanks to said chaos, we have new floors! Aren’t they pretty? 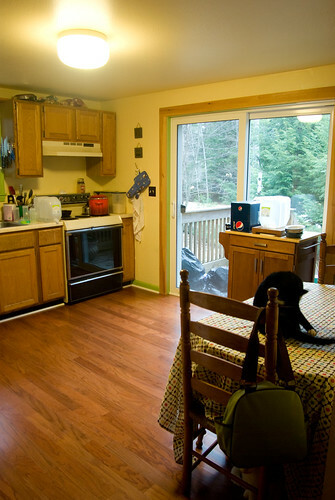 This photo gives you an idea of what the old carpet looked like, and here’s a “before” photo of the kitchen… as you can see, the wood is a huge improvement. Huge. 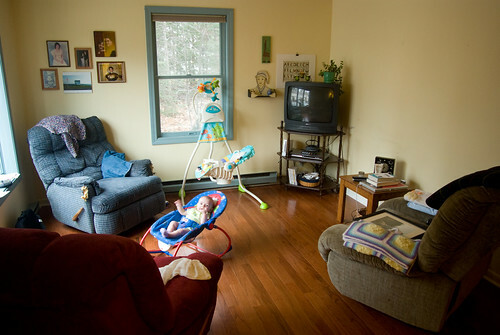 The first floor looks and feels so much bigger, and the warm tones make everything feel homey. As you can see, Ellie is quite excited about the change, too! Now we move on to phase two… the new carpet for the second floor will probably be installed next week. I’m especially looking forward to that because it means we can move Ellie into her own room. She currently sleeps in our bedroom in her crib, because it was handy to have her close by when she was waking in the wee hours to nurse. She started sleeping through the night about six weeks ago, though, so the change is overdue. Thankfully she’s a pretty easy-going kid, so I don’t think the transition will be difficult. After this it’s a matter of repainting, refinishing the kitchen cabinets and counters, replacing the (hideous salmon pink) bathroom fixtures, and adding our own touches. I haven’t felt motivated to work on the house much because of the awful flooring, but now I can’t wait to settle in… and it only took a year and a half!